The next morning began as usual. Traci was up early doing her yoga video. This hotel actually loaned her a yoga mat for our room. The breakfast buffet at the Sofitel was fabulous just like the buffets at our previous hotels. We had to be on the bus by 7:30 AM for our trip to see what we all came to see - the Terracotta Warriors! This was an exciting day for me. 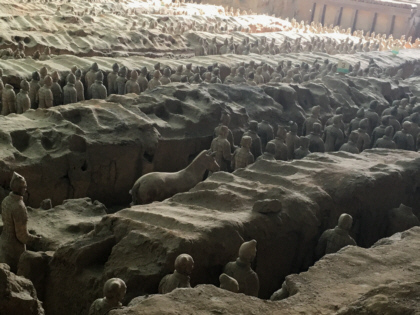 I don't remember if I learned about the Terracotta Warriors in school or from a TV documentary. 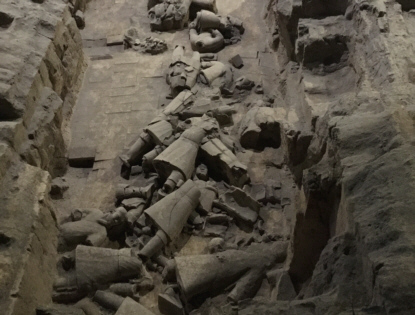 Emperor Qin Shi Huang Di became China's first emperor in 246 B.C.. Not long after that time, he became very concerned about who would protect him in the afterlife. He ordered his subjects to build him a mausoleum with warriors to protect him. It took 11 years to build the tomb. 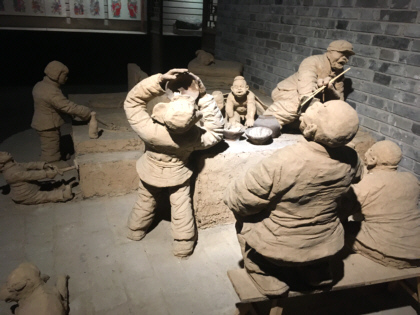 The workers constructed an army of life-sized clay warriors and horses. More than 8,000 of these warriors were created - each with a unique face. Additionally, chariots and weapons were built. 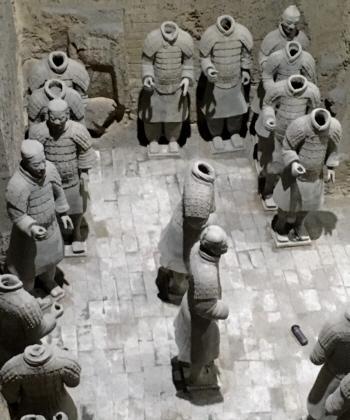 After the emperor's death, many of the clay warrior were destroyed by warring tribes. The statues lay crumbled in the ground for approximately 2,200 years until farmers discovered them in 1974. Excavation began shortly after. 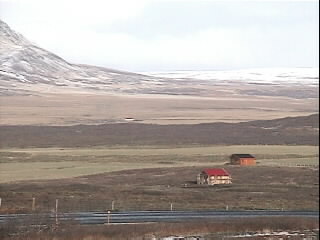 To protect the artifacts, warehouse-like buildings were built over the excavation sites. We were driven in golf carts from the bus parking lot to the entrance of the first warehouse. 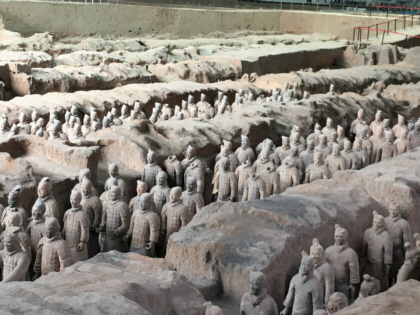 There they were - the Terracotta Warriors! There were rows and rows of them. This was my third pinch yourself moment of our trip. 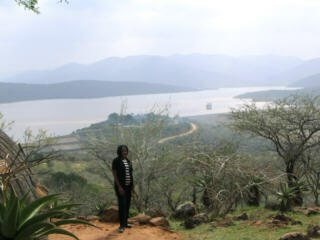 Our guide was very knowledgeable. She walked us around the warehouse providing all types of interesting information about the exhibit. This is still an active excavation site. 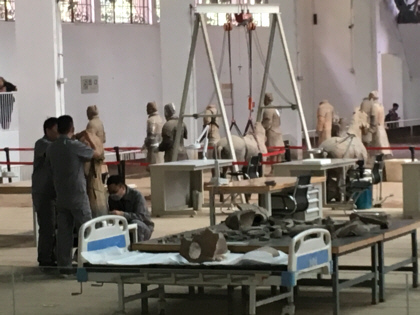 The archaeologist have to painstakingly glue the destroyed statues back together. 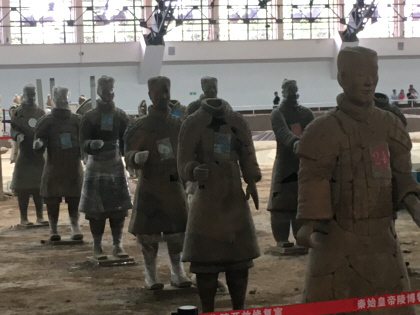 They have discovered that the statues were actually painted but the paint quickly fades when the pieces are unearthed. German scientists have recently developed a chemical that can be applied to preserve the paint. Not all of the statues were destroyed. Archaeologists were able to uncover some half-scale warriors, chariots, and horses that were totally intact. We were able to see those as well. 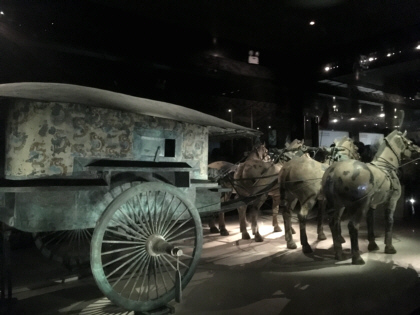 Another thing that struck me when looking at this exhibit is that you not only look at the warriors but you can actually see the stones of the paved road that was constructed over 2,000 years ago. We saw a film about the Terracotta Warriors in the theater. The theater could use some updating. It was a 360-degree setup with screens all around you but they were out-of-sync and some of the speakers sounded muffled. Despite this, the film was very informative. We had a family-style lunch at the Terracotta Warriors complex. There were two noodle stations as well where chefs were making the noodles by hand. There was a miscommunication that caused our server to think everyone at our table was vegetarian when in fact only three people were. As a result, no meat dishes were brought to our table. We did not realize this until lunch was almost over. When our guide found out what had happened, she went to discuss the situation with the staff. The next thing I knew, our sweet, mild-mannered tour guide was in a heated argument in Chinese with one of the waitresses. I seriously thought they were going to come to blows. Fortunately, that did not happen. 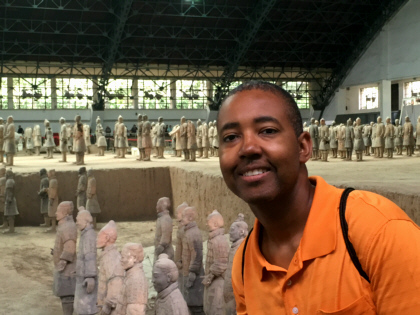 From the Terracotta Warriors, we were driven to a jade factory. It was like the rest of the factory/shopping stops we had been doing since Hong Kong - a presentation and then to a showroom to shop. 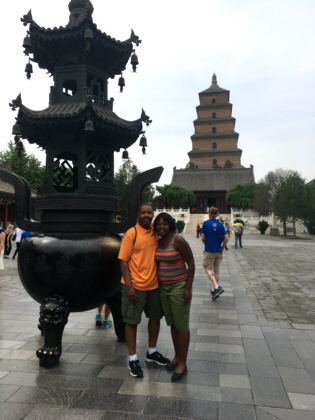 The Wild Goose Pagoda was our next destination. 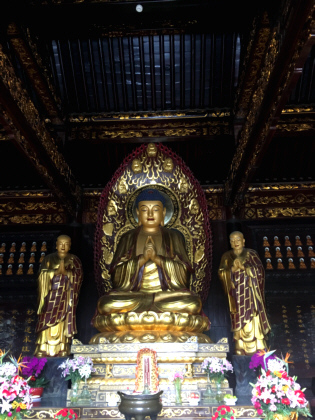 It was first built in 652 to house Buddhist material collected by the monk Xuanzang who traveled to India and many other distant lands. 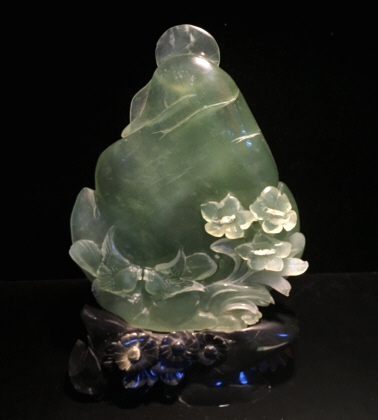 Most of what he collected during that time no longer exists; however, the pagoda tower remains. 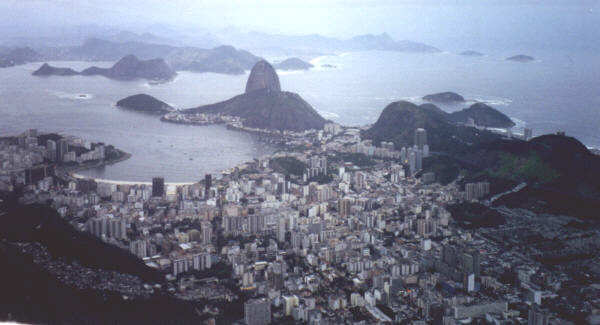 It has been restored several times over the centuries. But now it seems the Leaning Tower of Pisa is not the only leaning tower. Due to earthquakes and other factors, the Wild Goose Pagoda is actually leaning. 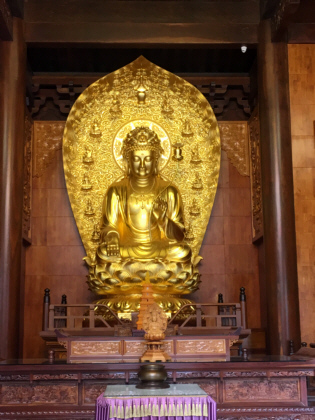 There were several interesting Buddha statues in the other buildings near the main tower. During our visit, we saw people burning incense and praying. Our guide did a nice job of showing us around but honestly, Traci and I were all ‘templed’ out at this point of the trip. It was off to the Tangbo Art Museum after the Wild Goose Pagoda. It didn't sound like anything that would interest me but I've learned to keep an open mind. 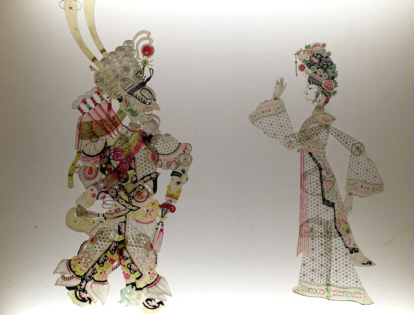 One of the staff members guided us through the small museum of Shaanxi folk art and old paintings. 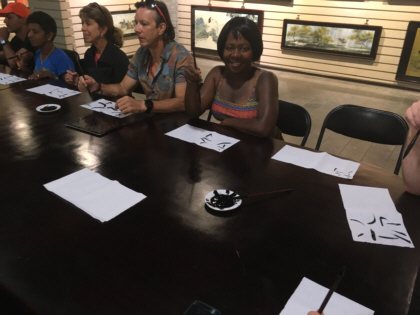 The most memorable part of our visit was the calligraphy class. We were all seated at long tables with brushes and ink. 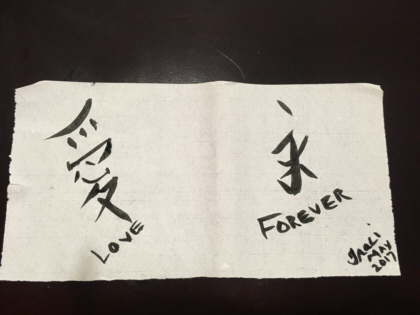 Our guide showed us some basic strokes and taught us how to write "Love Forever" in Chinese. It was a fun visit. It had been a full day of touring. We were dropped off at our hotel but had only 40 minutes to freshen up before the evening activity. 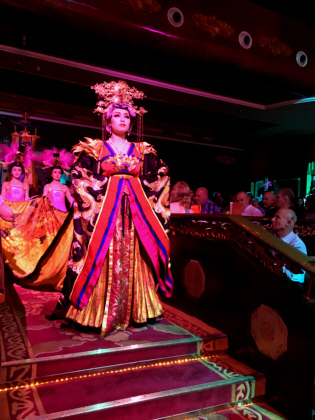 That night was the Tang Dynasty Dinner Show. 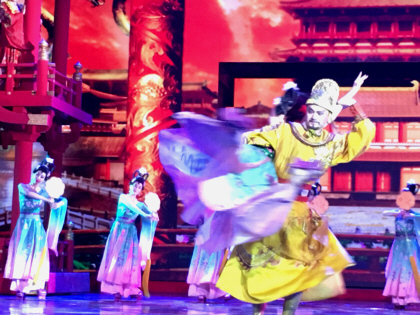 This was by far my favorite show during our time in China. 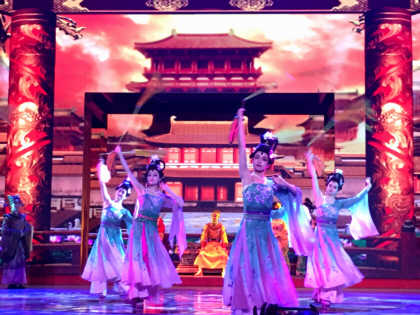 Through dance and song, it told the story of a concubine who ascended the ranks to become empress. Bear with me on this one. There were several factors that made this show so great. 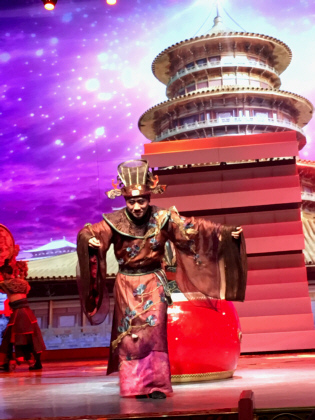 The elaborate costumes of the actors and the musicians were amazing. The dancing was captivating. The live musicians on both sides of the stage playing instruments I had never seen before kept the musician in me wondering. There were martial arts. 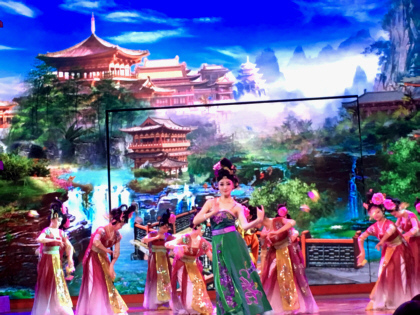 The entire background of the stage was a large screen where computerized videos played to enhance the scenery. 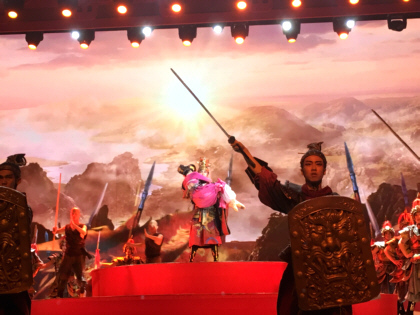 There was even a battle scene in which the stage action was synchronized with the video to make it appear as if warriors were jumping out of the video onto the stage. This show was fabulous! To help us understand the plot, there were monitors on both sides of the stage on which a synopsis was scrolled before each act. One screen scrolled English text. 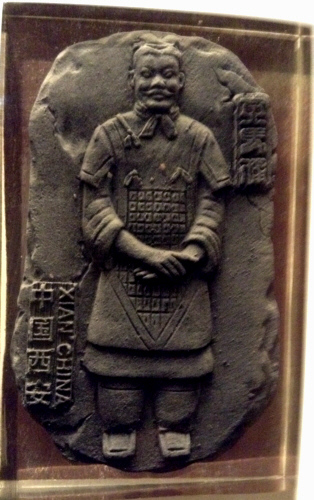 The other scrolled Chinese text. A very good dinner was served before the show. It was not a family-style meal. Hurray!